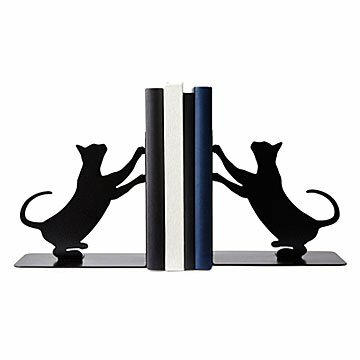 Bring your library to life with these sweet silhouetted bookends. For feline fanatics who can't resist sinking their claws into a good story, Eric Gross' eye-catching bookends keep your ever-expanding library in line and at a paw's reach. Hand cut from carbon steel, it captures the silhouette of two kitties just itching to get ahold of the books between them. Handmade in Kentucky. Purrfect for a cat lover! This is a stylish way to hold books. Granddaughter loves anything with cats! For an animal lover these are so great. And who doesn't have a place to use bookends! Show you love if animals! Keep my books in place and it looks charming too. This sweet design is active, pleasant and appealing to anyone who enjoys cat. The bookends are well-made and sturdy enough for any books. I prefer them atop a desk against a window for backlighting. They just make me happy to look at.